Wanna check other alternatives to your current dishwasher cleaner? 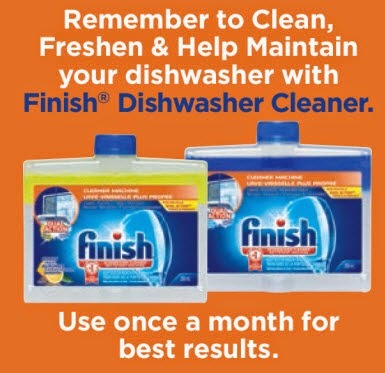 Finish is offering you a free product with this mail-in rebate. Save even more today! Save up to $8.00 on any Finish Quantum, Powerball, Power & Free, Jet-dry Dishwasher Cleaner with this offer. Once you purchase any of the above products, Finish will cover up the cost of the product. Finish will also cover the taxes and postage fees (by mail). This current offer is valid only on the products listed in the rebate form (downloadable in PDF). The offer is valid until November 16, 2014. That is your purchase of the Finish product from the list has to be made by this date. You will send your request for refunds before December 16, 2014. This offer is valid throughout Canada. Complete the form and attach the original receipt with the UPC code recorded.